For a brief intensive taste of Russia, old and new, spend 5 days in Moscow. Experience Russia's heart. From live underground bands to sedate cathedrals. Moscow is always changing and always Russia. Arrival in Moscow transfer to the hotel for check in and city orientation tour and walking tour of Red Square. Further activities for the first day will take into account the journey you have just made. This is your first full day in Moscow. The day begins with a 4hr private tour of the Kremlin which includes The Armory, The Diamond Fund and three of the Great Cathedrals. We then go to a cozy restaurant to sample some traditional Russian cuisine. The remainder of the afternoon will be free. The evening may be reserved for a visit to the ballet, concerts or circus subject to availability and taste. In the morning we will visit Kolomenskoe Park the 257-hectare estate which served as a country residence for the Russian Tsars from Ivan III to Peter I. Following a light lunch Russian blini (pancakes), that come with an assortment of toppings from caviar to honey, we shall take a visit to the Sculpture Garden opposite Gorky Park on the banks of the Moscow River. Here we also have the possibility to visit the New Tretyakov Gallery, home of contemporary Russian art including paintings by Kandinsky and Chagal. Dinner this evening will be in a fine Georgian restaurant with a spectacular view of the Novodevichi Monastery. The religious center of modern Russia established in the middle of the 14th century, Sergiev Posad is often referred to as the "Russian Vatican". 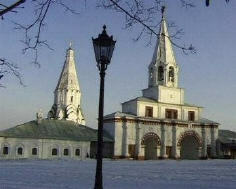 You will be taken on a tour of the monastery, including the unique churches located on its grounds. Lunch will be available in the monastery. A great opportunity to buy authentic souvenirs. Return to Moscow. Accommodation is 4 Star (Usually Ukraina). Concert or circus tickets are not included as they are subject to seasonable availability. If you have a special interest please let us know so that we can make advance arrangements. The host for your tour will be flexible with the schedule to get the most out of weather fluctuations and special interests. Museum tickets are included accept The Tretyakov Gallery which is optional. You can expect first class service in a relaxed atmosphere. A selection of Russian tours to take as they are or adjust to your needs. Visit the heart of ancient Russia. What is the Golden Ring? What you can see in Moscow. Come and work in the field on a Russian Archaeological dig. Full training given on site. Moscow, Suzdal and St. Petersburg. 8 days. Moscow and St Petersburg 8 Days. Moscow and the Golden Ring of Russia. Golden Ring 5 Days - 4 Nights. Overnight in Vladimir - Suzdal. Golden Ring 7 Days - 6 Nights. The Pushkin Fine Arts Museum. The Sculpture Garden and Gorky Park. Yasnaya Polyana-The Home of Tolstoy. City tour with Peter and Paul’s Fortress. Petersburg tour Saviour on the Spilled Blood. City tour with Alexander Nevsky Lavra. City tour with St. Isaac’s Cathedral. Hermitage Museum with one Treasure Gallery. Three Cathedrals of St. Petersburg. Yusupov Palace with Rasputin Murder. Yusupov Palace with Rasputin Murder and boudoirs. Peterhof (Petrodvorets) Park and Grand Palace. Southern BAIKAL and Olkhon island. Trekking to the Khamar-Daban Mountain Range. White Water Rafting on the Akha River. General Guide and Transport Service.